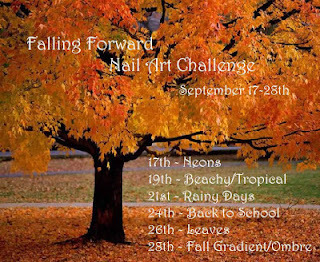 So I am still catching up on the falling forward nail art challenge. Today's theme is beach or tropical. My manicure is based on those cute tropical chameleons mainly because I wanted to test one of my newest polishes. This manicure uses Barry M Croc Effects Black to create the 'scales'. Croc effect polishes are only now starting to become more available from different brands, but as far as I know Barry M did this first. Croc Effect polishes are similar to crackle effect polishes apart from the fact you seem to get far more horizontal lines in croc effect to regular crackle. The effect sure is interesting and because every nail is different it creates a much more organic effect than stamping would achieve. Croc effect polishes must be applied to touch dry (but not completely dry) polish in very thin coats. I found the thinner the coats the smaller the scales. 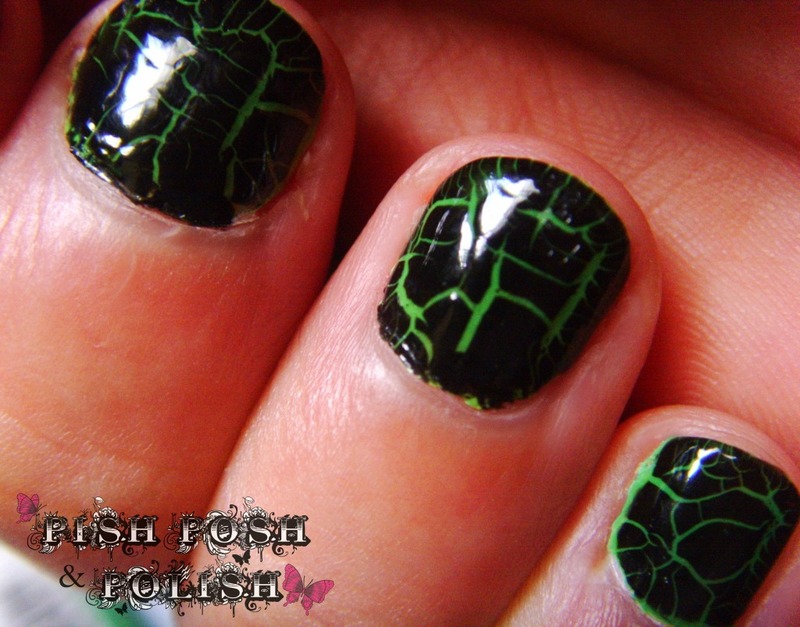 Also unlike normal crackle this effect is much slower and can take up to 4 minuets to completely develop on the nail. That's right I layered it over Claire's Mood Struck polish which is a colour changing polishes. This one changes from green to yellow and back again depending on the temperature. I have heard mixed reviews about these polishes but they worked well for me. On my short nails I could see that there was a graduation in colour as we got towards my tips. This was more apparent on my slightly longer thumb nail where the base was yellow and the tip a spring green. Interestingly not only did these polishes change colour in hot/cold water but also just throughout the day (they were yellow after I woke up from my warm bed and green when I left the house) which I thought was quite a cute talking point. This polish dried to a matte finish and although application was fine these were on the thinner side needing three coats to reach full coverage. Also due to the matte nature of the polish is dried super quick which isn't great when you need touch dry polish to apply the Croc Effects to. To solve this I painted a layer of normal (not fast drying) top coat onto each nail before applying the Barry M. Problem solved. As I type my nails are green so it must be cold here! So much for tropical! Here are the other lovely ladies taking part with me!